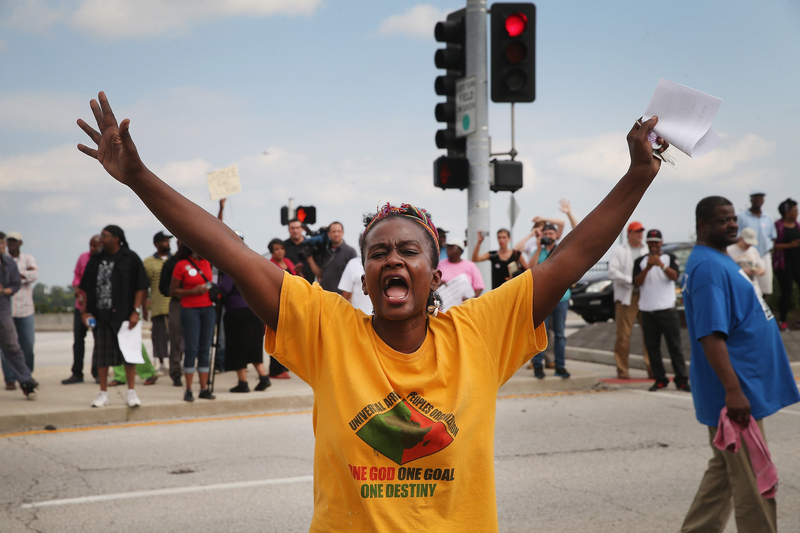 It's been more than six weeks since the fatal shooting of Michael Brown, but for the people of Ferguson, Missouri, their pain and anger hasn't subsided. On Tuesday morning, a mysterious fire burned down one of the Michael Brown memorials, prompting Ferguson's citizens to gather in protest once again. By Tuesday night, Ferguson had erupted in unrest; police tried and failed to contain furious demonstrators and looters, painting an all too familiar scene. According to the St. Louis County Police, who were assisting the Ferguson Police department, the crowd began to gather around 9 p.m. At one point in the evening, as many as 200 protesters had gathered on West Florissant Avenue, where shots were heard being fired. Nobody was struck, but several demonstrators were arrested for throwing rocks and bottles at the officers who tried to disperse the crowd. Fires were also set to the Whistle Stop at the old train station, and to an auto repair shop that fixes police vehicles. The chaos once again prompted protestors to start looting. The Beauty Town store was targeted for the third time in just over a month, just after it was beginning to return to its normal routine — it had even hung a banner saying "Beauty Town Is Back!" Tuesday night's unrest was sparked by a contentious fire that had engulfed one of the two Michael Brown memorials on Canfield Drive, where the teen was shot. According to Ferguson resident Meldon Moffitt, the fire started around 6:30 a.m. on Tuesday. The cause of the fire is still unknown, but citizens immediately suspected police involvement, speculating that the fire had been set deliberately to deface the memorial. While police say that the fire could have been started by the candles at the memorial site, which were mixed in with stuffed toys, many residents aren't buying it and called out the flaws behind that logic. There was no way a candle did this. That fire was burning too high and too hot. Whitt also said that he had smelled gasoline. Not one candle can put all the stuff that was up there on fire. Come on now. It's too moist out here. The Ferguson Police department released a press release on Tuesday saying that they were still investigating the cause of the fire. Chief Thomas Jackson asked that anyone with photos, videos, or information contact the police. One resident managed to record the fire on video, which strangely revealed eyewitnesses (including the cameraman) and police standing by as they watched the memorial burn. The recorder can be heard asking the officers, "Did you guys do this?" The officers do not respond.